Theme Hospital, a 1997 management sim created by Bullfrog Productions, was an incredibly tongue-in-cheek experience with a vague resemblance to actual medical institutions. Fun was the main goal and it created an atmosphere that would have you giggling with glee while your patients were dying left and right. It never took anything seriously and was all the better for it. For roughly 20 years following, there wasn't a hint of a sequel or continuation on the idea that so many had become enamored with. Then in January of this year, Two Point Studios announced its intention to create a spiritual successor to Theme Hospital. Sporting two members of the original team behind the hit hospital tycoon game, Two Point Hospital had everything lined up to become an instant classic for fans of Bullfrog's hit. While a few issues hold it back from being a total knockout, Two Point Hospital manages to recapture everything that made its successor so special and then some. Upon booting Two Point Hospital, you're greeted with a short video parodying infomercials that would run in the '90s. It proudly proclaims that, "52% of patients leave believing they are healthier than when they arrived," and gets you into the vibe that this latest game is aiming for. Much like its predecessor, nothing is to be taken seriously. Machines will burst into flames, people will be walking around with lightbulbs for heads and you may see a clown or two. After that short introduction, the game then gives you a world map with which to select your first hospital from. Instead of going for a purely sandbox style game (like Rollercoaster Tycoon), Two Point Hospital is more of a guided tutorial campaign that slowly introduces new concepts to you. After earning at least one star in a hospital, you'll move onto the next one to continue your career. If you don't stick around with each hospital, you may be surprised at how quickly you'll blast through everything. There are a total of fifteen locations and while the difficulty does gradually increase, earning a single star doesn't take that long. What will hinder your progress is your understanding of management sims and the quirks they contain. Since you aren't taking direct control of characters and running the machinery first hand, you'll be left to the mercy of the game's AI. This is what killed a number of Sim City copycats in the '90s and thankfully Two Point Hospital is more an evolution of what worked instead of a total reinvention. The rules aren't changed from the past, just pathfinding is cleaned up and placing objects is all the easier since you're given smoother control over the camera system. 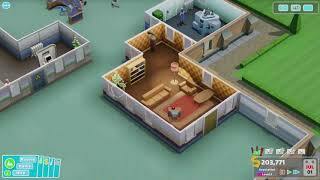 No isometric views here, you can zoom in, rotate and even change the angle at which you're staring into rooms. Much like Theme Hospital, Two Point Hospital allows you to customize the room layouts of your medical institution. From here, you'll be able to create complex winding pathways or simple hallways to section off each area of your hospital. You'll have access to all the basic stuff from the start, but will slowly acquire new rooms and set dressing as you journey through the campaign mode. While room sizes shouldn't really be tweaked (the basic requirement is more than enough space), you are free to decorate and reshape rooms as you see fit. While you'll unlock most of the rooms from simply playing the game, there are a number of secondary challenges that will unlock an in-game currency for you. Going by the name of Kudosh, this will allow you to get even more items that you can place around your hospital to increase its aesthetic appeal. If you want a cactus in your waiting rooms or a gigantic fountain in the doctor's office, those will be available after saving up enough currency. Hiring staff to handle your hospital is a key part of Theme Hospital. You'll be given a list of different doctors, nurses, assistants and janitors for hire with different skills that should (theoretically) make them better employees. Everyone has a cost you'll need to consider against the hospital's finances and picking the best candidate for your current situation is always a tough choice. Thankfully, you can opt to go for a cheaper doctor and train them up, which then sees you saving money and them becoming better in a natural manner. Where special props need to be given is to whoever came up with the ridiculous puns Theme Hospital sports. Patients with "Lightheadedness" will walk around with lightbulbs for heads, people with "Night Fever" will dance around like John Travolta, and even just the names of all the diseases are ridiculously hilarious. When I was sitting there showing my family how ludicrous it was that someone was afflicted with "Grey Anatomy," I was rolling my eyes at how fiendishly clever the writing was. It creates an airy atmosphere that lends itself well to the cartoonish visual design. The main drawback to Theme Hospital is that no sandbox mode exists at all. Even after progressing through each main hospital, the only thing left to do is let your cogs turn in perpetuity. You'll still have items to unlock with Kudosh, but you won't be able to lay the foundations of your own personal hospital as you see fit. For that matter, you can't even create floors above the main hospital, leaving everything on a single level. The campaign also doesn't truly get much more difficult. Like I said above, if you have any understanding or past experience with management sims, you'll basically know how Theme Hospital works from the get go. You can certainly tweak the prices on operations and snack dispensers, give raises to your employees and even pick up certain characters to change their priority, but amassing money isn't that tough of a challenge. It would have been nice to create your own custom scenarios where you'll need to work under certain limitations or can have patients bum rushing your hospital at random hours. The campaign does give some needed structure to what would otherwise be an aimless game, but it definitely hurts a bit to finish each location and not feel particularly taxed. That you can't even then tinker around with a separate sandbox also limits the longevity of this game. Theme Hospital is a refreshing romp through a nostalgic genre, but one that only marginally tweaks and updates the past instead of reinvigorating it. That being said, I'm absolutely taken with the atmosphere that Two Point Studios has created here. Maybe the game isn't hard enough for a veteran of such titles, but it doesn't kowtow to "modern" standards and dumb down the mechanics at play. 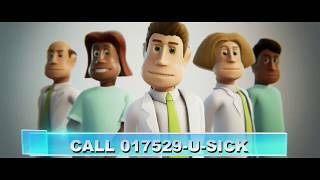 This is more a sequel to Theme Hospital than just a remake and it has supplanted that original game in my mind. There are some things missing, of course, but the groundwork laid here is excellent and one that I'll happily return to from time to time. 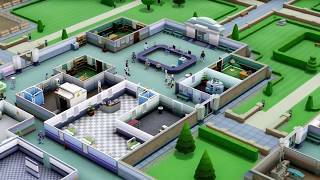 learly going for a cartoonier look, Two Point Hospital manages to strike its own distinct style that compliments the sterile environments that hospitals are known for. While maybe a bit too easy for genre veterans, Two Point Hospital updates the classic formula with new additions that breathe life into its proceedings. Sporting an actual campaign, Two Point Hospital can last around 25+ hours should you feel compelled to three star everything. Even if you don't, you're looking at a more guided experience than past management sims. While not seriously taxing on most hardware, some of the hospitals balloon out in size and cause framerate drops and slight pauses as the game catches up. While not a massive shakeup to a long dormant genre, Two Point Hospital is a wonderfully crafted romp through nostalgia and hilarity. It may be too easy, but it is always entertaining and lays the foundation for something more. Two Point Hospital is ranked #472 out of 1434 total reviewed games. It is ranked #20 out of 146 games reviewed in 2018.